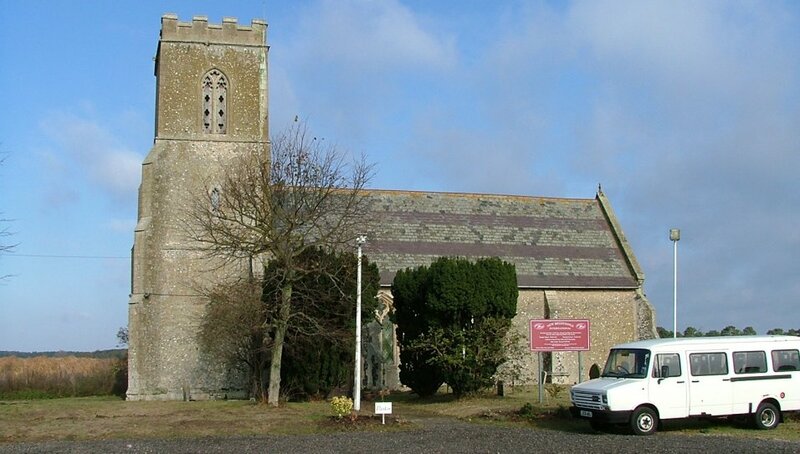 This was to be my 638th Suffolk church, the penultimate medieval parish church of my journey around the county. There was an end-of-term feeling as we sped out of Brandon, and the dull town fell away behind us. Ahead were the towers and fences of the vast Lakenheath American airbase, one of the largest in Europe. Perhaps I was not yet prepared for quite how strange this leg of the journey was going to be. 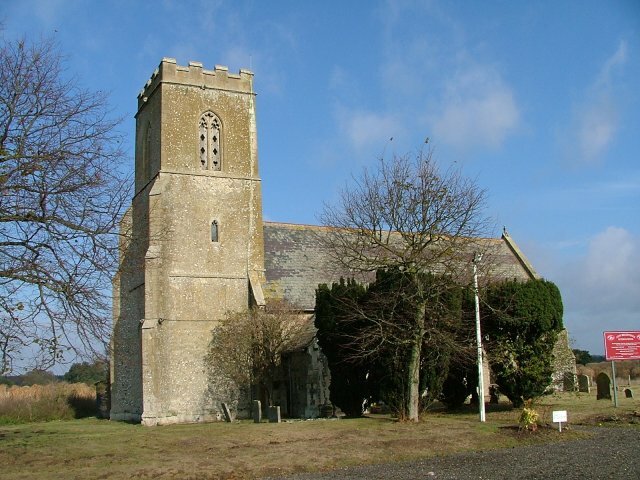 Although the tower of St Denis is visible from the Lakenheath to Brandon road, there is no public access. No public footpaths reach it, no roads. It is enfolded by the American base, and stranded on its small island of graveyard in the strangest landscape I had seen so far on my journey. It was part heathland, part marsh. Strange clumps of reeds towered 3m or more into the air, punctuated by stunted pine trees. It was the first of November, and a line of men dressed in green were driving pheasants and partridges away from the base fence towards the marsh. So close to a military installation, they seemed sinister as they went about their methodical work. On the map, we'd found a marked farmtrack that appeared to go close to the church; but when we reached it, it turned out to be no more than a muddy path churned up by agricultural vehicles, or possibly military ones. It would have been quite impossible to have driven up it. We turned back, and found the service road that led up to the perimeter fence. The road took us up to a closed gate. Beyond, a troop carrier sat watching, a group of bored soldiers inside looking solidly ahead. I peered through the wire to see if any narrowed eyes suggested fingers itchy on triggers, but they were immobile. Off to the right, another farm track, this one surfaced, led vaguely in the direction of the church. A large sign said Private - No Through Road. We debated what to do. The map showed a public footpath running alongside the farm track, and as I said to DD, it didn't actually say STRICTLY private, it didn't say you must not pass this point under any circumstances. And in any case, what was the worst that could happen? The soldiers in the troop carrier could open fire on us, in which case we would apologise, turn around, and head back to Brandon. We set off along the track, which ran directly beside the perimeter fence. Phantom jets were preparing for take off; soon, their noise would overwhelm the land around us. After about half a mile we reached the former Wangford Hall. This and a couple of ramshackle 19th century cottages are all that is left of the former village of Wangford, now hidden under the Lakenheath base. It was never big; at the 1841 census, when many Suffolk villages reached their largest population, there were less than fifty people. Now, it is almost all gone. The public footpath ended here, but the track doubled back, and onto the blasted heathland. It narrowed and became more uneven. Apart from the eruptions of birds being driven on by the beaters, and their calling to their dogs, there was no natural sound. It was an eerie place. The lane suddenly opened out, and the church was ahead of us. Surreally, the carpark was all new and neat and tidy, and a white minibus sat beside the graveyard. I suppose I should have expected the minibus. 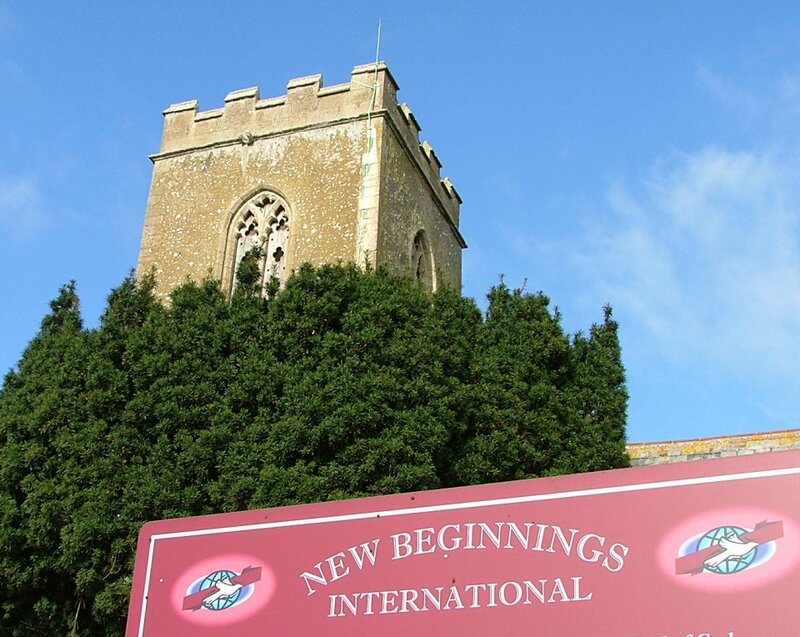 Since redundancy in the 1970s, St Denis has been in the care of the New Beginnings International church, an American southern baptist outfit, who have put up a large red sign detailing their activities. They seemed very busy, although I couldn't help thinking that the quotation from Nehemiah was rather inappropriate under the circumstances. Anyway, baptist churches always seem to have white minibuses. It seems to go with the territory, like Catholics and confession, or Anglicans and flower festivals. I was disappointed to discover that the sign did not have an address or telephone number on it. I suppose that the chances of persuading someone to come out to this godforsaken hole and open up for us were fairly slim anyway, but now there was no chance. 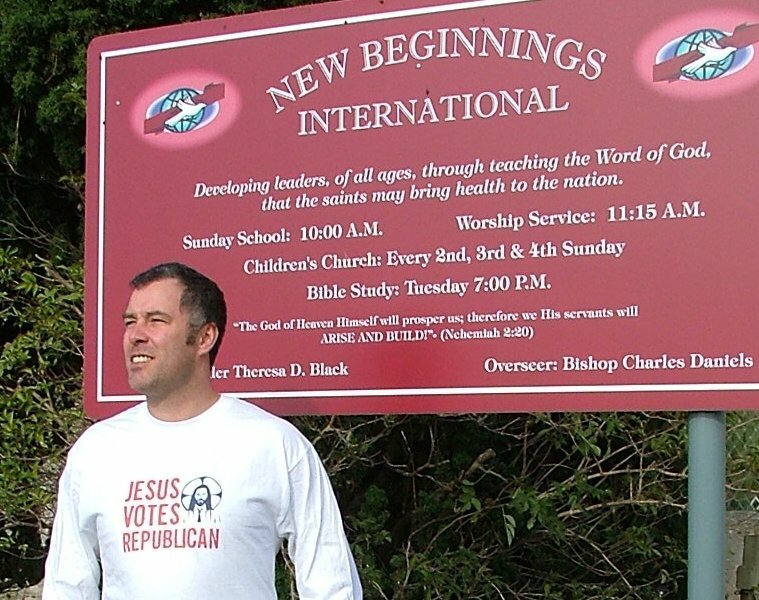 This was a pity, because I had recently invested in a Jesus Votes Republican t-shirt from CafePress, and I was wearing it now. I had thought it might help if I needed to ingratiate myself with members of an American baptist church, or any other Americans I might meet, especially ones carrying guns. We tried the door anyway, but of course it was locked. 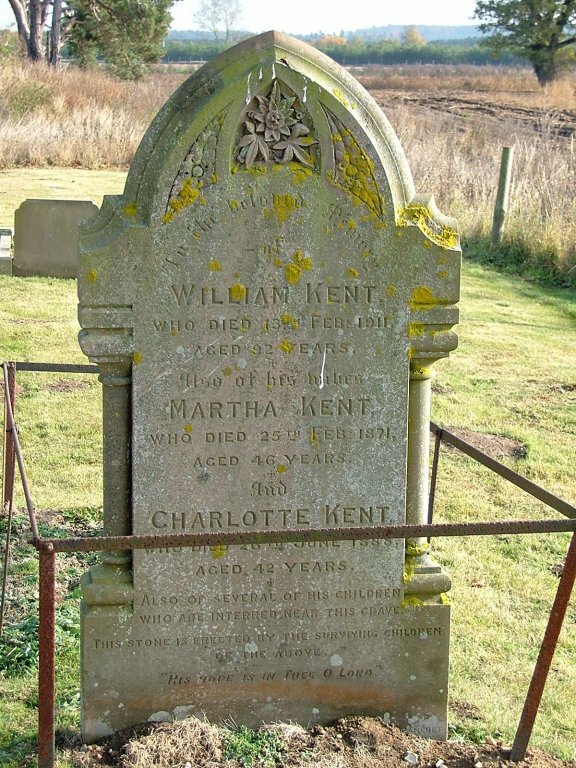 I had encountered something similar at Kenny Hill on the other side of Mildenhall, also now in the care of an American baptist church. And Kenny Hill is nowhere near as remote as this was. We tried looking through the windows, but they were all blocked off on the inside. It was as if a new church had been built inside the old one, as DD observed. It was disappointing to not be able to see inside, but we had a look around the outside anyway. 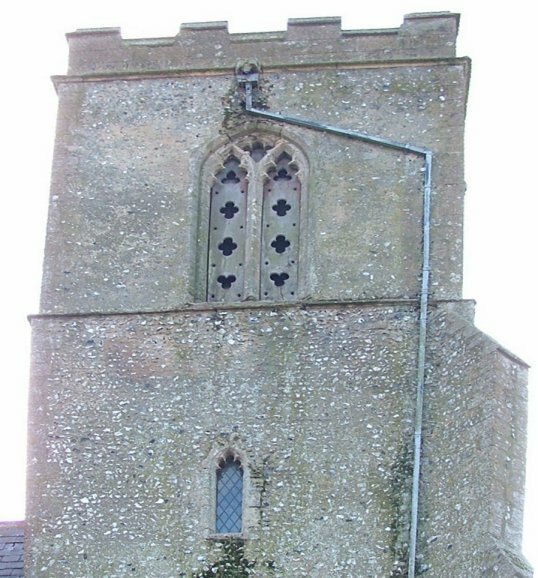 Cautley goes on at great length about the venerable age of this building, and Norman Scarfe in the Shell Guide admires the 13th century east window. 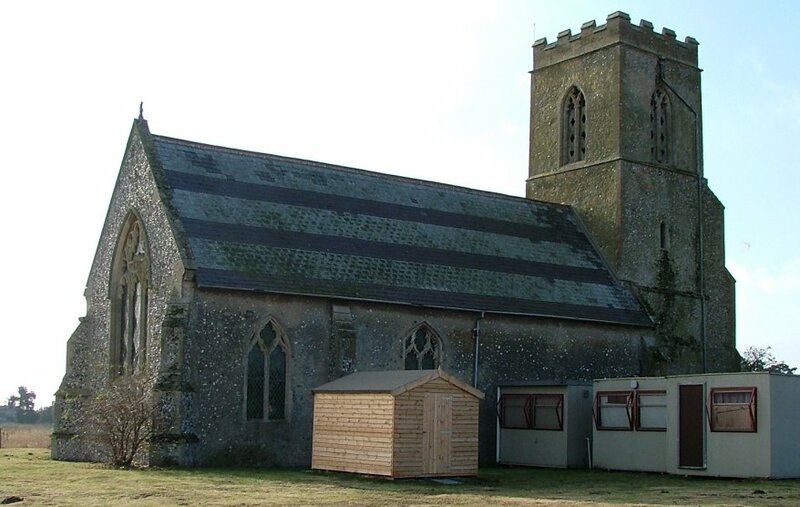 Cautley's 1975 editors blow the gaffe a bit by revealing that, apart from the tower, the whole church is a 19th century rebuild of the original nave, but as DD pointed out there is considerable old walling remaining, especially on the south side. The windows are all Victorian, though. Around on the north side was a hidden cluster of portakabins; presumably the offices of the baptist church, but I couldn't help be reminded of those top secret research establishments there used to be in 1970s episodes of Dr Who. The most important work on the planet always seemed to be done in broken down huts and Victorian lunatic asylums. So unlike the X Files. 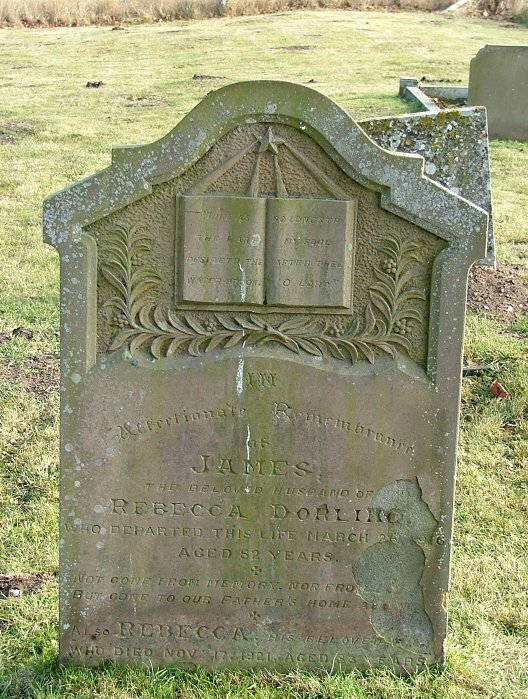 I spent some time photographing gravestones; people were still being buried here up into the 1970s, but their memorials must be so rarely seen now. It was at this point that the guns opened up. 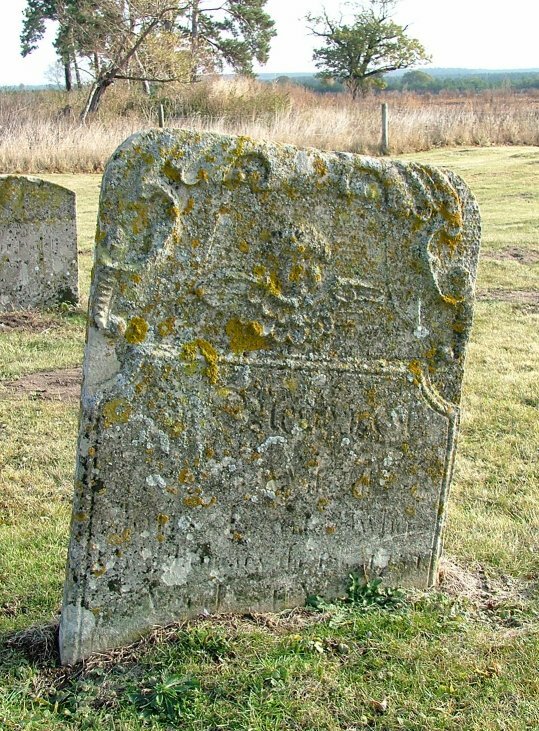 On all sides of the graveyard, men in green were firing up into the air as partridges and pheasants broke cover. The beaters had fallen back, and it occured to me that we were rather vulnerable in this island graveyard. I hoped that the local fauna didn't think of this place as a wildlife sanctuary, and start flying towards it. Not far off, an enormous old hare broke cover, and lumbered back up the track, the way we had come. It was time for us to follow him. But I couldn't leave without looking at the clump of trees just over the graveyard wall, beside the first track we had found. There it was that the bodies of Holly Wells and Jessica Chapman, the two Soham schoolgirls, were found last Summer. I said a silent prayer, and then we set off for Santon Downham, Phantoms erupting over our heads. 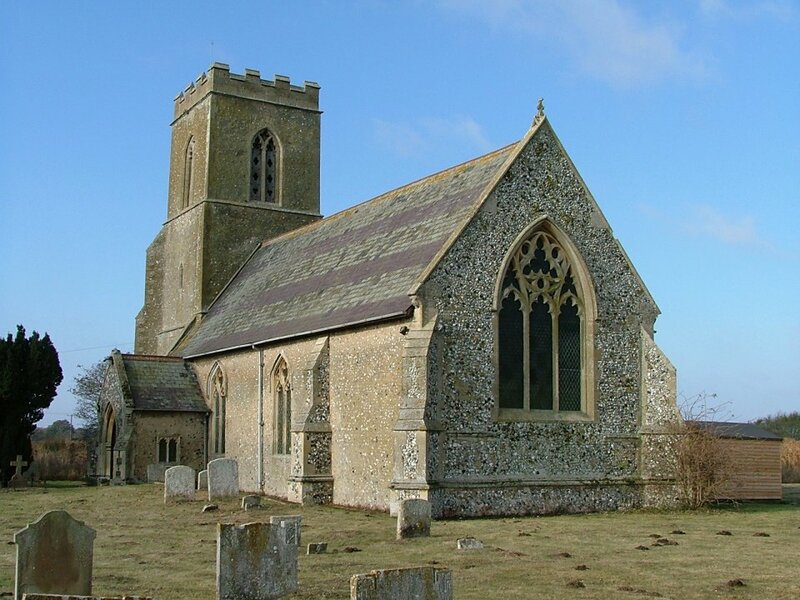 St Denis, Wangford, is one of the most difficult of Suffolk churches to approach. Near the junction of the Brandon to Eriswell and Brandon to Lakenheath roads, a side-road runs off to the perimeter fence of the American airbase. At the guarded gate, a lane runs off to the right along the outside of the perimeter fence. The sign says 'Private - No Through Road', but you are going to have to ignore this I'm afraid. The roadway runs alongside the airbase perimeter for about half a mile, with scrub and pinetrees on the other side. Eventually, it reaches the former Wangford Hall. This is as far as the public footpath goes, but don't give up. A lane doubles back to the right, becoming narrower and more uneven. It passes some run-down 19th century cottages. Eventually, you will see the church ahead of you in its island of graveyard. It is kept locked, and there are no keyholders.